The Militant was at Los Angeles International Airport's Bradley Terminal on Thursday night to drop off mama and papa Militant, who were taking a trip to their unspecified Third World country of origin. As you may or may not know, LAX is undergoing a massive remodeling/expansion project, and things have been shifting around. But seemingly untouched so far were the airport's gift shops, which sell overpriced snacks, curios and souvenirs to travelers, and for many travelers, the last place to buy stuff in the USA before heading to their destination. Airport gift shops are known for selling souvenirs that represent the local city or region, and the products they sell can tell a lot about that locality, so the Militant wanted to take a look, through the eyes of a visiting tourist. As expected, one can find t-shirts, caps, jackets and mugs for the Lakers, Dodgers, UCLA Bruins and USC Trojans. There are a few t-shirts, sweatshirts and jackets bearing the name "Hollywood" of course. But the one that caught the Militant's eye (and curiosity) was a hoodie in a "crush" font that bore the writing: "LOS ANGELES - California - 1888"
Usually when you see a four-digit number associated with a city or corporation, that four-digit number is the year of founding, riiiight? Now, most of you who read the Militant Angeleno, even if you may not be militant Angelenos yourselves, know real basic Los Angeles history, especially the year that our great city was founded. What year was that, class? [sound of schoolchildren yelling out] 1781!!!! That's right, class! Los Angeles was founded in 1781. September 4 to be exact. The Militant observes it every single year. Okay, we'll get technical. Because in 1781 there was no state of California, and this wasn't even the United States of America yet. So for you smarter kids, what year was Los Angeles incorporated as an American city? [sound of schoolchildren yelling out] 1850!!!! Correct again, class! Los Angeles was incorporated as a city under American law on April 4, 1850. So this leads to the big question...what's the deal with the 1888? 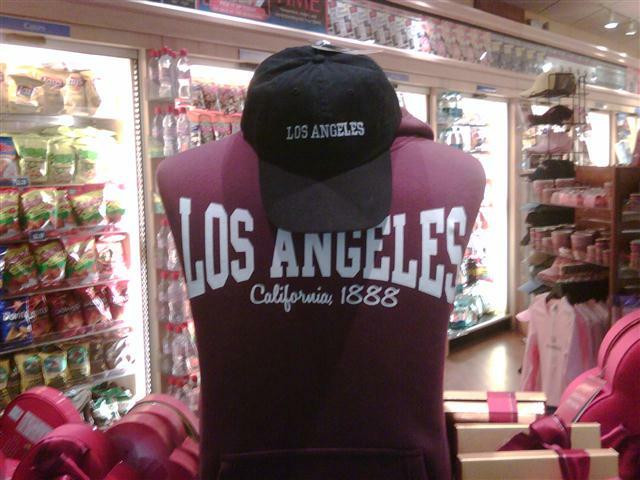 Well, we do know Los Angeles was not founded in 1888. It was already around for over a century, and was flying the stars and stripes on its civic buildings for 38 years. The Militant can't seem to find anything significant in Los Angeles that was established in 1888 (It obviously couldn't mean the founding date of LAX -- airplanes weren't even invented yet..duh!). He does know that the San Fernando Valley community of Chatsworth was founded in 1888, and so was the City of Orange, but none of those are printed on the shirt. The shirt was made by the Lincoln Heights-based screenprinting and embroidery company Adin of California. Should the Militant let them know what's up (They're not very far from the Lincoln/Cypress Gold Line station)? Or is this part of a larger conspiracy to make Los Angeles appear to have less of a history by knocking off 107 years, and using a sweatshirt to "educate" tourists on our "history?" Get it right, fools! Commandeered by Militant Angeleno @ 2:34 AM 5 comments: Hyperlinks, yo! Westlake is Los Angeles' most densely-populated neighborhood, with a population concentration rivaling Manhattan-type levels. But long ago - a century ago - in fact, it shared a vastly different comparison to NYC: The Westlake District was Los Angeles' version of NYC's Upper West Side, or even Paris' Champs-Elysees. In the 1880s, after the former swamp-turned-city dump-turned reservoir was converted into Westlake Park and a quarter-century before Beverly Hills was even founded, the Westlake district was Los Angeles' bougie district. It's where the residents were, in the parlance of the time, puttin' on the ritz, if you will. There were mansions, like the McKinley Mansion and the Grieri-Musser House, built within walking distance of the park (in the green-shaded area of the map above). In the northwest corner of the park was the Park Plaza Hotel - back then (before it became a glorfied movie set) an actual hotel catering to the L33t of the day and resort destination in the 1920s-1930s. Before the Militant set out to his meeting, he surveyed the area on a map and noticed one street went against the diagonal Spanish street grid in a more absolute east-west alignment (see map above). The name of the street was "Ocean View Avenue." So the Militant had to bike it for himself. Can you see the ocean from there? Well, hard to say. Okay, basically, no, he couldn't, but on this clear, warm winter day, he looked towards the south and can see the South Bay, the Palos Verdes Peninsula and part of Santa Catalina Island in the far-off distance. So maybe that's what they were getting at (The picture doesn't do it justice, but the Militant swears the northern tip of Catalina can be seen just to the left of the palm tree...for realz!). With the mantra of real estate eternally being "Location, Location, Location," this neighborhood was most likely one such place, aside from being close to a major City park and L.A. Railway Yellow Car trolley lines. For you see, aside from Ocean View Ave., there were other "Views" in this particular part of Westlake: Park View Ave. (which affords you a view of - guess what - MacArthur Park (a.k.a. The Park Formerly Known As Westlake Park)), and Grand View Ave., which doesn't really give you a view of anything, save the Downtown skyline (which didn't exist back then) or St. Vincent's Medical Center (which, although it was in existence a century ago as the Los Angeles Infirmary on Sunset and Beaudry, wasn't even built on that location until 1971). But maybe it just gave you a grand ol' view. Of course, having a view meant you were on some promontory of some sort. And believe it or not, the elevated area actually had a name: Nob Hill. Yes, Los Angeles had its very own Snob - er - Nob Hill. One last vestige still exists to this day: The Nob Hill Towers - an "art deco" (the apartment owners obviously don't know their architecture) style apartment building that no doubt has some overinflated rents (pictured, right). As the Militant biked down Nob Hill on to Coronado Street and headed west on 6th, the clash of late 20th-century architecture greeted him instantly. But not before he happened to pass by an old-school neighborhood market - the Big "6" Market (referring to the street, obviously) which hadn't changed its 1930s-era signage from backinthaday. Of course, Westlake doesn't just have MacArthur/Westlake park, but two more parks: LaFayette Park, just mere blocks away to the west and one park that many don't even recognize as a park. Believe it or not, the half-mile median strip along Occidental Blvd from Beverly Boulevard to 6th Street is an actual park, known as the Occidental Parkway, which is recognized as part of the City's Dept. of Recreation and Parks system. The "park" consists of a dozen median islands, alternating with circular islands, which may or may not have contained something fancy like fountains or planters or whatnot (anyone have any historical pics of backinthaday?) [Update: See below]. Today, though, the islands are a popular dumping area for bulky items such as couches, cabinets, televisions, discarded boxes and mattresses. Coming up in Part 2 (sometime in the near future) - We'll take a look at some mansions...if they're still around. MILITANT UPDATE: Thanks to the Los Angeles Public Library Images archive (Duh, why didn't the Militant think of that before?). Here's a picture of Occidental Blvd taken 80 years ago (January 1931); it clearly shows the circular islands were used for rose bushes and palm trees, and in fact, look at how short the palm trees were back then! Commandeered by Militant Angeleno @ 2:58 AM 6 comments: Hyperlinks, yo! Let's face it, the Militant was a bad Militant in 2010. Not "bad" in the naughty sense (he wishes he were, believe the Militant), but "bad" as in not very prolific. With a paltry less than 70 posts for the entire year, he humbly apologizes to his readers (all 9 of you) for not being a very active Militant in twenty-ten. He didn't even think doing a year-end Militant Year-In-Review post was even worth his time, or yours. Meh. Whatevers. So now we're here in a new year, it's time to reset, look forward and start anew. So here goes, 2011, lets do this! The Militant spent his last few hours of 2010 doing what a Militant usually does, and used Metro's free New Year's Eve rides as reason enough to leave The Militant Compound in his unspecified Central Los Angeles neighborhood and ring in 2011 in Downtown Los Angeles. Bundled to the hilt in layers so much that none of his camo fatigues underneath were visible, he boarded his Red Line train to Downtown and saw some hyped-up Wisconsin fans, decked in red, in town for The Rose Bowl game (Sorry, kids). Of course, with 9-degree temps back in Madison, surely a 40-something night in Los Angeles for them is like 9/27/2010 for us or something. He got off at Pershing Square and soon headed for Angels Flight Railway, which was celebrating its 109th birthday on Friday, its first anniversary since re-opening in March of last year. They celebrated with one-cent rides, commemorative tickets and free prizes at Grand Central Market (dang, missed that one...). As he looked at the clock, it was nearing 10, so he made it up, dropped his penny, and with 10 minutes to go until the funicular closed, intended to be the last Angels Flight rider of 2010. One car came up, with three ladies inside, who were told by the operator that it was the last ride. He was willing to let them ride back down for the final ride. "Not so fast!" said the Militant, who dropped his penny, and chivalrous dude he is, told the women, "Ladies first..." Muhaha. So we all rode down together on the final Angels Flight ride of 2010. And the Militant was the last to leave Olivet at approximately 10 p.m. so hark! The Militant Angeleno was the final Angels Flight rider of 2010! The Militant chatted with the ladies, dropped some of his Militant knowledge on the Flight's history and later found themselves partying it up together at an unspecified bar in Downtown Los Angeles to ring in the New Year! Whatup! At around 11:59 a.m. the TV screens there showed the three-hour-old ABC television broadcast of New Year's Rockin' Eve (this practice needs to stop, Pacific Standard Time people...even the musical performances were taped sometime in November). But behold, it was no longer 2010 but now Twenty Eleven. Afterward, the Militant and his new operatives all took a stroll through Downtown to see various sights bedecked for the Holidays, such as Pershing Square. We passed total strangers on the street and all of us wished each other, "Happy New Year!" How cool was that? Later in the day, the Militant decided to take his first bike ride of 2010. And like any major holiday in Los Angeles, the streets were pleasantly quiet. He probably passed no more than two dozen cars on his route. It was almost like CicLAvia - he didn't have to wait three months and nine days for it! As the first sunset of 2011 approached and back-lit the high-flying cirrus clouds in the cool winter sky, the Militant looked back on a great day, with a new year, new friends and new adventures to come. Where will the Militant be taking you the next 365 days? Stay tuned...and STAY MILITANT! Commandeered by Militant Angeleno @ 11:18 PM 3 comments: Hyperlinks, yo!